LONDON--(BUSINESS WIRE)--Technavio market research analysts forecast the global sports fishing equipment market to grow at a CAGR of close to 4% during the forecast period, according to their latest report. This market research report segments the global sports fishing equipment market into the following three major products (fishing rod, fishing reel, and fishing lure) and three major regions (the Americas, APAC, and EMEA). Currently, fishing has become a popular recreational activity with participation from consumers of almost all age groups. Prominent particularly in the Americas, it is a vibrant outdoor tradition. As the activity encourages wellness, fosters bonding with friends and family, and most importantly forges a deep connection with nature, the popularity of sports fishing is increasing rapidly. In the US, the activity of fishing takes place near lakes, rivers, streams, and seas. Annually, more than 45 million Americans are united by the love for fishing. New fishing participants that represented a higher percentage of female and youth than the general fishing population is another driving factor contributing to the growth of the market. Moreover, the majority of these newcomers try freshwater fishing for the first time. In the near future, as connecting the youth to fishing will inspire passionate anglers, the fishing industry is expected to have the world's youngest citizens to nurture a new generation of fishing enthusiasts and ensure the industry is thriving. The Americas was the leading region for the global sports fishing equipment market in 2017, accounting for a market share of 44% and is also expected to lead the market over the next five years. The revenue and the growth in the market are mainly driven by the US, which had more than 51 million anglers in 2016. The market is expected to grow at a fast pace, as many anglers are participating in regular fishing. The additional increase in women participation has helped to contribute largely to the growth of the market, especially in this region. Education Technology reports. This offer is valid only till the 28th of this month. Celebrate winter sports with 23% OFF all reports in our Outdoor Gear library (Offer valid from Feb 9-25). 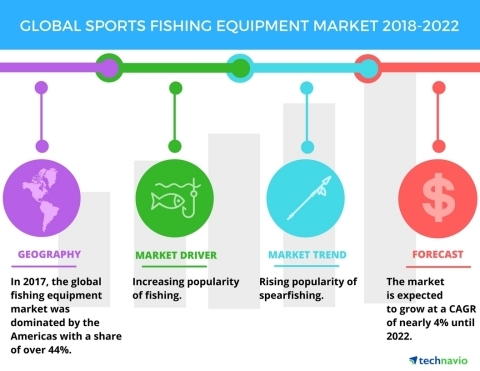 Technavio market research analysts forecast the global sports fishing equipment market to grow at a CAGR of close to 4% during the period 2018-2022.